Q: How was FVT&W begun ? A: A simple conversation among friends was all it took to set the seed for the club. 4 families and have grown to 11 in our first year. Q: Why did FVT&W choose to affiliate with an international organization like FCRV ? A: Tom felt that an established, formal organization had more to offer our new club. We could take advantage of events and programs already in place in FCRV. FCRV also provides Liability Insurance, free of charge, to it's Chapters. Q: Why FCRV, instead of an other organization ? provide to a new club. Q: How far does your membership area extend from Elgin ? A: At the present time our farthest member family resides in Peoria - About 80 miles away. Q: What classification of camping does your club promote ? A: Our membership is focused toward popup and tenting families, but anyone else is welcome. Q: What area do you utilize for camping weekends. for FVT&W camping and don't want to spend our entire weekend driving. Q: What type of campgrounds does FVT&W use ? 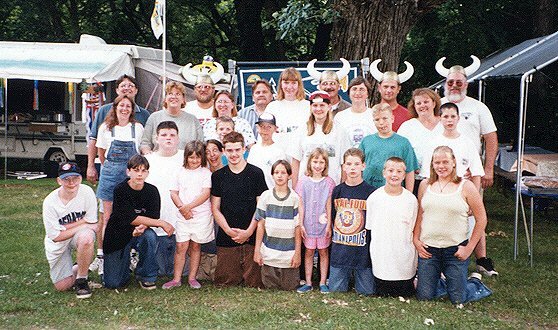 Q: I'm not sure my family would enjoy a group camping club. How do I find out if it's for us ? families to join, but how can you tell if you'll enjoy group camping if you don't give it a try ? Q: What are the financial requirements of FVT&W membership ? Do you have more questions ?? ?